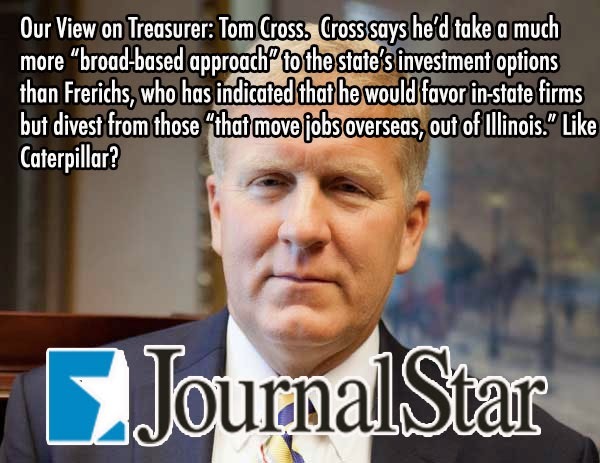 The fourth newspaper in Illinois has endorsed a candidate for Illinois State Treasurer and for the fourth time, that newspaper has endorsed Tom Cross over Mike Frerichs. Cross says he’d take a much more “broad-based approach” to the state’s investment options than Frerichs, who has indicated that he would favor in-state firms but divest from those “that move jobs overseas, out of Illinois.” Like Caterpillar? Frerichs says that’s not what he’s talking about. Cross says “I’m pro-Illinois, but that’s a naive approach,” with which we’d largely agree, as maximizing investment returns, for taxpayers’ sake, with reasonable risk ought to be the priority. Frerichs also has criticized the state’s “overseas” investments, when in fact it has only one — Israeli bonds — to which he now says he has no objection. Both candidates say they favor combining the treasurer and comptroller offices, though Frerichs has previously hedged on that score. From this perspective, there should be no hesitation about that. Finally, Frerichs touts his status as a “certified government finance officer,” though as Champaign County auditor a decade ago he backed an early retirement initiative that ended up backfiring, not producing the promised savings for taxpayers but costing them — to the tune of $2 million-plus in extra unfunded liability, which forced the county to borrow the difference. Cross has been hammering him on that, and it does give us pause.